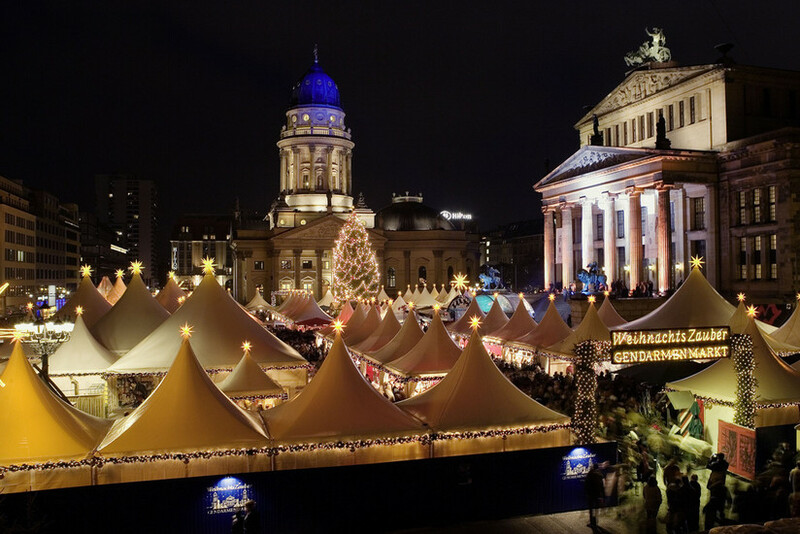 Berlin's many outdoor Christmas markets (Weihnachtsmärkte) bustle with both tourists and locals. 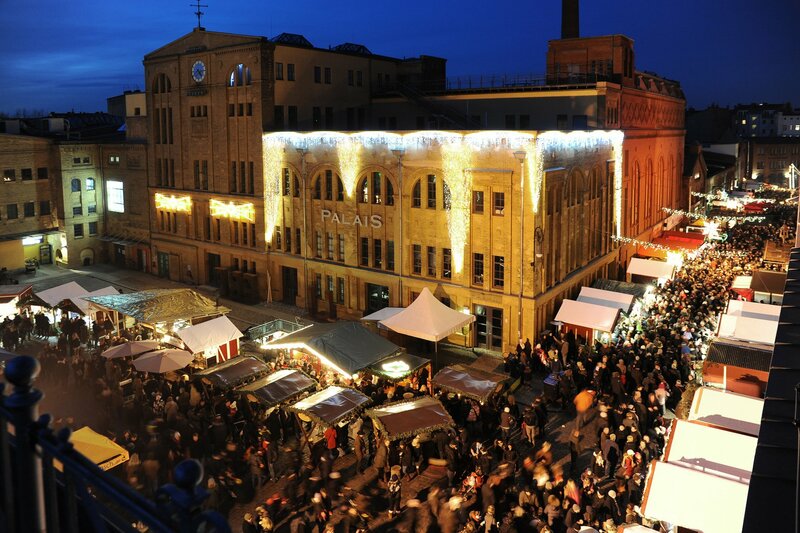 There's music, food, drinks and great gift shopping, as the markets offer mainly handicrafts and decorations such as the popular wooden trinkets from the Erzgebirge mountains. Then there are also huge fruitcakes (Stöllen) and nutcrackers (Nussknacker), scarves, hats, and gloves of richly coloured felt. 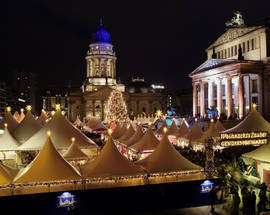 Wrap up warm and stay tanked up on the Glühwein, hot mulled red wine, sold at all markets in souvenir mugs. 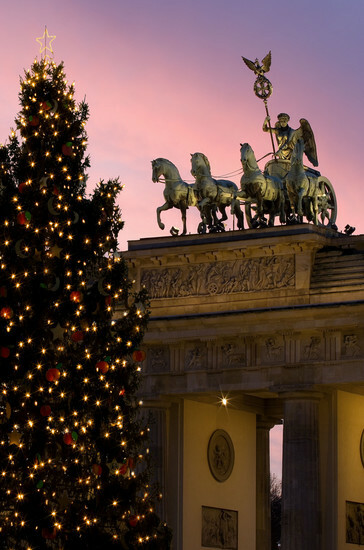 Germans make Christmas a far less commercial holiday than in some other countries, and instead whip themselves into a frenzy with cookie-baking sessions, classical music concerts and opera. 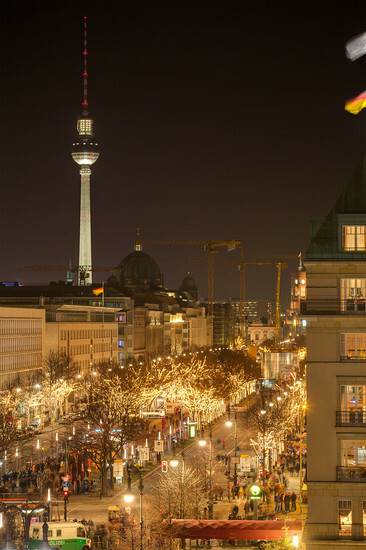 In Mitte's designer and gallery district, the 'eco-friendly' Christmas market takes place on Sophienstraße, one of Berlin's most beautiful streets. 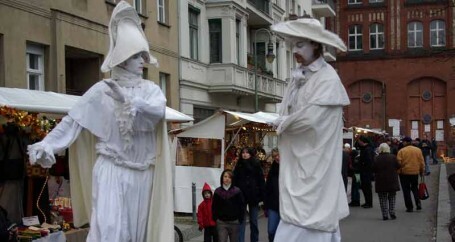 Stands sell all manner of useful, eco-friendly and unusual Christmas gifts, of German or fair-trade origin. The market is kept stylish and low-key, and a limited but fine selection of food stands offers crepes, organic Bratwurst, raclette and Glühwein. There's live music, performers, angels, and Santa drops by every day for the children. 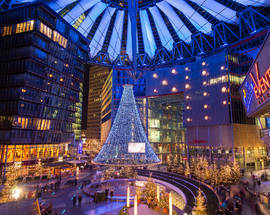 Weihnachtsmarkt Sophienstraße, Mitte, S-Bahn Hackescher Markt, U-Bahn Weinmeisterstraße, www.weihnachtsmarkt-sophienstrasse.de. Taking its name and influence from the Nordic goddess of light, the Lucia Christmas Market is a festive party with a difference. All things Scandinavian are embraced here, although its stunning location on the grounds of a 19th century brewery adds a distinctly Germanic tinge to the whole thing. 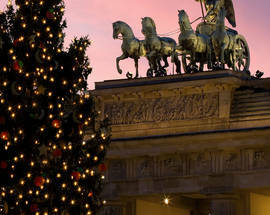 It works in every single way, and those looking for a unique Christmas experience in Berlin need look no further. There will be plenty of Scandinavian innovation on show, including a special open air coat heater that must be experienced. A magical location, forward thinking attractions and even a visit from Santa Claus himself make this a must-visit market in the capital. 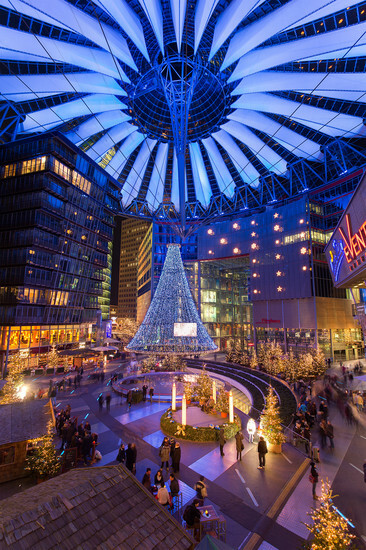 One of the oldest and most popular Christmas markets in Berlin (no small feat when you consider the history and popularity of the things here), the Berliner Weihnachtszeit is found just a short walk from Alexanderplatz near to the Town Hall. 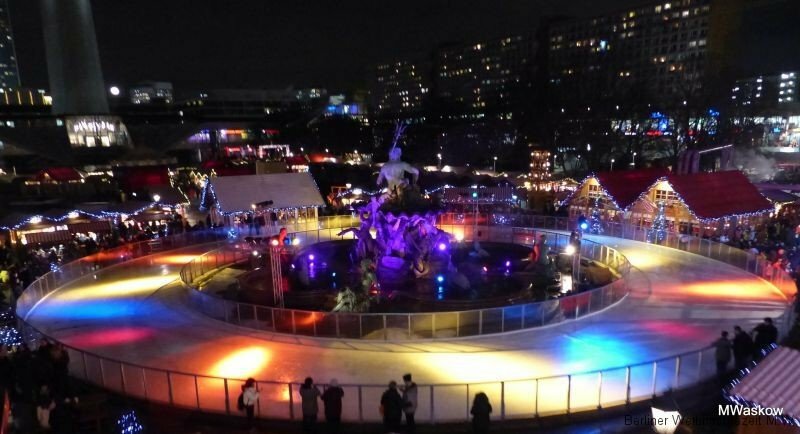 The heated Glühwein cabins are a genuine work of genius, and the circular ice rink is the largest in the city, not to mention the most entertaining. Skates can be rented, although those bringing their own get to skate for free. Santa comes three times a day, so it must be good! The market opens on November 26 and runs through until December 30, under the watchful eye of a gigantic carousel. One of the most beautiful wintertime sights in Berlin and held on the second weekend of Advent, the Rixdorf market, located in a quaint village that was swallowed Berlin's Neukölln district a century ago. This traditional market lit by oil lamps and featuring pony and camel rides strives to recapture the small town feel of old Rixdorf. Running for one weekend only and featuring handmade crafts and other wares sold only by charitable organizations, this piece of old-world Christmas tradition is one attraction not to miss. Richardplatz 28, Neukölln, U-Bahn Karl-Marx-Straße. 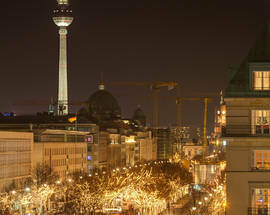 While Christmas might be a mellow affair in Berlin, the days preceding New Year’s (Silvester, after the saint whose name day falls on 1 January) suggest a war-torn city that hasn’t quite given up its arms yet – that’s what happens when the corner store sells fireworks to naughty twelve-year-old boys. 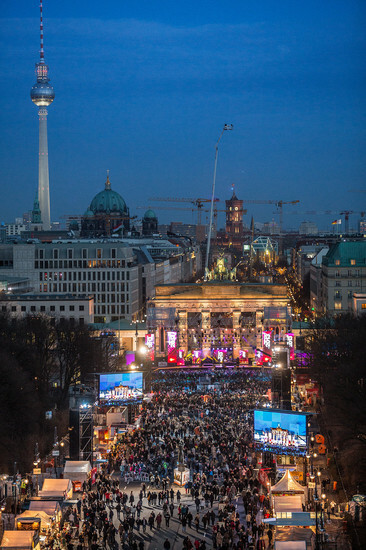 The city throws a free, 2km-long party that stretches from the Brandenburger Tor at Pariser Platz all the way to the Siegessäule column in the centre of Tiergarten park. You won't be celebrating alone – up to a million people show up every year, making this the world's largest New Year's Eve party. Note that you can't take large bags, fireworks, glass, large plastic bottles, alcoholic or drinks into the party zone. 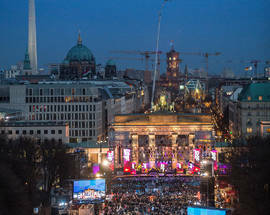 For detailed information see silvester-berlin.de. Many larger stores and malls will open on the Sundays (from 13:00-20:00) leading up to Christmas and remain open till late at night on weekdays. Museums are largely open during the holidays. 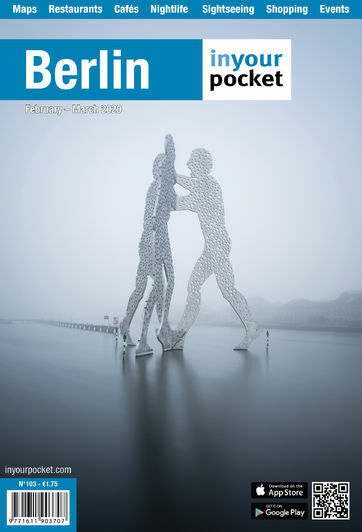 The Hauptbahnhof tourist office is open daily during the holidays. Nearly everything closes earlier on the 24th. Public transport operates as on Sundays on 25 Dec and 1 Jan, and has extra services running throughout the night on New Years' Eve.